Preheat oven to 400°F. Open biscuits and cut each into 4 equal parts. Roll each of the biscuit pieces firmly into a ball. Place on a large, parchment-lined baking sheet. Bake for 9-13 minutes, or just until the biscuits turn a light golden brown. Remove and cool, then slice in half, hamburger bun style. In a stand mixer, beat together pudding powder, Irish cream, and 2/3 cup of the heavy cream. Whip on high until the mixture thickens and becomes fluffy. Spoon into the center of sliced biscuits. In a medium, microwave-safe bowl, heat together the remaining 1/3 cup heavy cream and Andes™ mint pieces for 60-90 seconds. Stir until smooth. Drizzle over the top of each mini eclair. Allow chocolate topping to set. Serve and enjoy, or refrigerate until ready to serve. 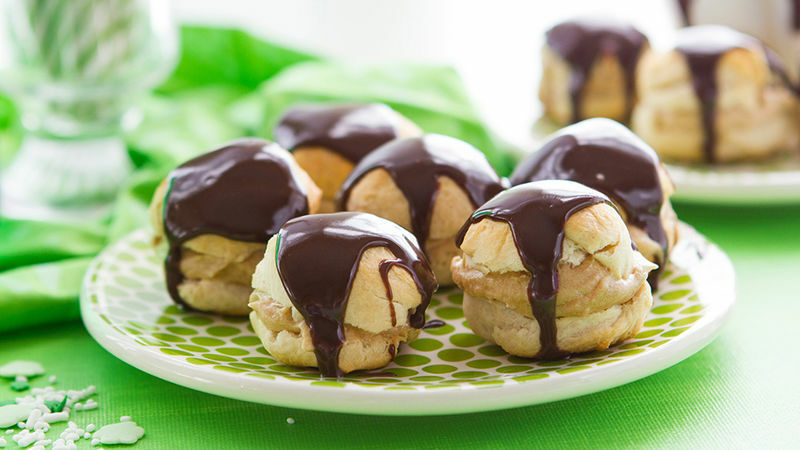 Mini eclairs made with Irish cream liqueur and topped with melted Andes™ mints. Mmm. I like to prep this recipe by starting with the filling. That way, I can whip it up and let it chill until needed. It lets me wash all the pots and pans while the eclairs bake themselves into golden wonderbuns. It also lets me lick the filling for lunch. And this filling? Irish cream, cream, and pudding. It’s maybe the luckiest lunchtime lick one will ever whip up at the noon hour. Here’s an insider baking tip: I once made real-live eclairs. Like, Julia Childy whipped and whisked and boiled and baked eclairs. I started the day with hope and ended the day drowning in dirty pans, covered in batter, and considering a move away from baking and into biotech. It sounds so much more fun. The good news is Pillsbury inventionists made it possible to make a whole batch of copycat pastries. With one pan. In 18 minutes flat. A tube of flaky Grands!™ biscuits is the trick. You just open and slice each into four even pieces. Roll into beautiful little balls. And bake until golden and gorgeous. From here the recipe comes together quick, starting with a simple slice through the center of each pastry. Then an easy boozy filling, made with cream and Irish cream liqueur, is spooned beautifully onto those pretty little pastries. Then we make a super quick two-ingredient mint ganache made from Andes™ chocolate bits + a bit of cream microwaved for about a minute. And you’ll be drizzling dark chocolate divinity and mint kisses all over your fluffy little buns. It was love at first lick. And ba-zinga! at first bite. Enjoy, sweet ones. These mini two-bite treats are just about the best thing to hit St. Patrick's Day since... ever.